We went to the clinic for the egg retrieval. It was a tad stressful because once they ensured, via sonogram, that my follicle was indeed still there and large (holding the egg), I wanted to make sure they grabbed the egg while it was still there waiting. I went upstairs to get in the hospital attire and wait with some other women. Women came and went and I was still sitting there after what seemed like forever. All the while, I was willing my egg to stay put until the doctor could take it out of me. Then, while some other ladies and myself were sitting in the pre-op waiting room, there was a TV showing CNN, and guess what they were featuring at that moment? A story about an EMBRYO MIXUP from a fertility procedure in Ohio. YIKES! Not something a bunch of women awaiting egg retrieval or embryo transfer need to see. Thankfully, I opted for the minimal amount of valium so that I didn’t lose my egg sitting right there watching that – lol. I almost passed on the valium, but decided it was important to be as relaxed as possible and the valium would help that. I had it last time they did the retrieval of multiple eggs. So, the nurse gave me the smallest dosage this time since we were just retrieving one egg. 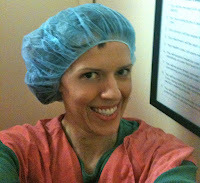 I’m usually quite the anti-drug girl, but there are times when I think they’re warranted… like fertility adventures. Then, it was my turn. I practically jumped out of the recliner and skipped to the procedure room when my name was called. They double checked my identity (whew). And, I hopped up onto the table, put my legs in the stirrups and waited for the doctor. What came next I was a little unprepared for. You see, last time I had the procedure done, like I said, I had valium (probably a normal dosage, i.e. higher than what I had today) and I had been taking a strong anti-inflammatory prescription drug for a few days prior to the procedure. This time, I was instructed to take 600 mg of over-the-counter ibuprofin twice before the retrieval (12 hours apart). What I’m trying to get at is that this single egg retrieval was a little painful. Like… ouch! Sure, I’ve had worse pain before in my life, but this was a pokey kind of needle-like pain. Perhaps last time it felt the same when getting the multiple eggs, but I didn’t care because of the larger valium dosage I was on. That’s all I can come up with because I could definitely feel it this round. BUT! It’s all worth it so far… we successfully retrieved my egg! YAY!!!! They’ll fertilize it today and let me know tomorrow if fertilization was successful. Then, we’ll let it grow until day 5 and transfer it into my uterus on Sunday. Yippee!